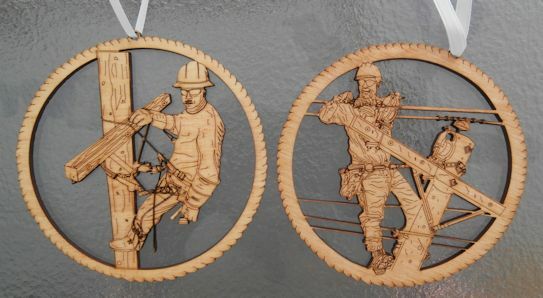 These beautifully crafted, highly detailed Journeyman Lineman Stained Christmas Ornaments are made of birch wood, made here in the USA and is priced under $10 each. Measuring 4" in diameter, they is sure to please any power lineman at Christmas. Order with the fall restraint device (ornament on left...without fall restraint on right) Exclusive product of TNT!